Proteases/peptidases play an important role in a variety of biological processes ranging from digestion and metabolism through to hormone activation and apoptosis. Furthermore, various non-human proteases facilitate important cellular processing from many human pathogens and thus, proteases are often important drug targets. It is to this end that our laboratory seeks to understand the structure-function relationships of proteases that can ultimately contribute to the drug discovery process. We are particularly interested in two proteases angiotensin converting enzyme (ACE) and plasmepsin V (PmV). ACE is a zinc metallopeptidase that cleaves a wide variety of physiologically relevant substrates; including vasoregulatory peptides angiotensin I and bradykinin, the anti-fibrotic agent N-acetyl-SDKP, the neurotransmitter substance P and the adhesion molecule amyloid β peptide. Since ACE is primarily involved in the production of the vasoconstrictor angiotensin II, ACE has become a well-validated therapeutic target for hypertension, congestive heart failure, myocardial infarction and renal disease (including diabetic nephropathy). There are two forms of the enzyme: a somatic form of 150-180 kDa and a smaller germinal isoform of 100-110 kDa which is expressed in the testes. Unlike nearly all zinc metallopeptidases the somatic enzyme has two homologous catalytic sites that display subtle differences. 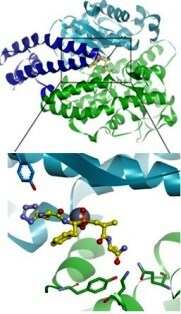 Our group has solved the structures of the ACE C- and N-terminal domains complexed with various clinically important inhibitors (as well as novel domain selective inhibitors), which has in turn opened the door to: 1) a better understanding of the structure-function relationships of each domain; and 2) the structure-based design of the next generation of domain specific ACE inhibitors. PmV is a membrane bound aspartyl protease present in the endoplasmic reticulum of the Plasmodium parasite. PmV has recently been shown to be the specific protease responsible for the cleavage of the plasmodium export element in the signal sequence of many exported plasmodial proteins. Inactivation of this protease results in a reduction of protein transport, as well as drastically decreasing parasite virulence and is thus a promising target in the development of novel anti-malarial therapies. ACE crystal structures The research group has been actively involved in the resolution of a number of individual ACE domain crystal structures, the majority of these structures containing the enzyme in complex with ACE inhibitors. Such information has provided critical insight into the binding mode of ACE inhibitors and a structural perspective of the molecular basis of domain selectivity. Current work involves the engineering of an appropriate construct suitable for crystallisation of the full length somatic ACE molecule. ACE inhibitor design – Figure 1 Utilising the abovementioned crystal structures, we have identified several residues in the obligatory binding site that are different in chemical nature between the N- and C-domains. We are using this information to design inhibitors that have optimal contacts with these key residues, such that the molecules will be domain selective in their binding. Such compounds have been produced by organic medicinal chemists in the laboratory of Prof Kelly Chibale (UCT). To date we have designed, synthesised and tested a number of novel ACE inhibitors several of which displayed prominent changes in domain selectivity which are currently undergoing further in vitro and in vivo testing. PmV inhibitor design We are interested in the establishment of a heterologous expression system for PmV and the subsequent development of a high throughput bioassay. The establishment of this work pipeline, which is currently underway, will allow for the testing of novel PmV inhibitors, synthesised in collaboration with Prof Kelly Chibale. Glycans in folding and stability – Figure 2 Many eukaryotic proteins are post-translationally glycosylated. Our work focusses on the determination of the minimum glycosylation requirements for ACE folding and activity and the effect that reduced glycosylation has on protein stability. This approach has allowed us to engineer forms of the N- and C-domains which are amenable to reproducible crystallisation, something that was previously unattainable. We are currently using this approach to identify the minimum glycosylation requirements for the full length somatic ACE construct. Substrate specificity Despite having high sequence identity and very similar structural topology between the N- and C-domains of ACE, there are differences in substrate processing between the two domains. This suggests an important role for the unique amino acids present in each active site in providing key interactions to enable this selective process. We utilise site-directed mutagenesis to convert key active site residues to their corresponding domain counterparts and assess the effect this has substrate processing. Furthermore, these mutants are useful in elucidating the contribution of active site residues to domain selective inhibitor binding. This work provides valuable insight to guide the inhibitor design process. Chloride dependence The activity of the C-domain of ACE, and to a lesser extent that of the N domain, depends on the presence of chloride ions. In this regard, the chloride dependence of ACE activity is unique among the metallopeptidase family. We are using mutagenesis, enzyme kinetics and isothermal titration calorimetry to investigate the role of key residues that interact with the chloride ions as well as residues that may be responsible for the gating of a channel allowing the anion access to the chloride cavity. 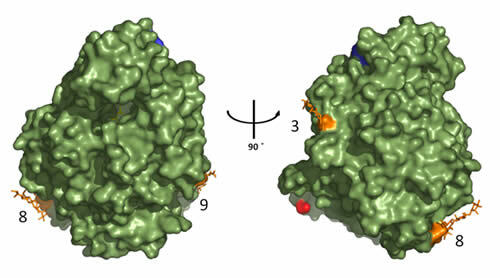 Full-length somatic ACE domain cooperativity Despite ACE having two domains, each with a functioning active site, literature reports (from our group and others) have indicated that these domains do not function in a completely independent manner. We are interested in further elucidating the interaction between domains and the effects of this interaction on substrate processing and inhibitor binding. ACE shedding Many membrane-bound proteins are proteolytically released in a process referred to as ectodomain shedding. Protein ectodomain shedding affects the function of a variety of structurally and functionally diverse molecules on the cell surface, including cytokines and growth factors, their receptors, adhesion proteins, and other molecules, such as the amyloid precursor protein, Notch and Delta. We are presently investigating the shedding of ACE, specifically, we are investigating the identity of the protease(s) involved in ACE shedding and the regions of ACE that allow for contacts between the substrate and protease(s). Receptor-like signalling – Figure 3 ACE appears to have another interesting role, in addition to its classic protease activity, in that is able to function with receptor-like characteristics upon dimerization and inhibitor or substrate binding. We are interested in studying the domain and substrate specificity of "receptor activation" and subsequent signalling cascades. Figure 1: Using the crystal structure in the identification of important unique amino acids in the N-domain active site. The novel selective inhibitor Compound 33RE (yellow) is shown binding the catalytic zinc ion (gray sphere) between subdomains I (blue) and II (green). This insight has given us a further rational basis for the structure-based design of N-domain selective ACE inhibitors and implicated several residues in selective substrate processing. 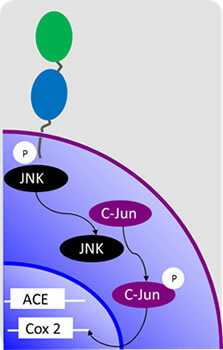 Figure 3: The receptor-like function of ACE, in this case mediating its effects through the JNK pathway. We are interested in the effects and pathways mediated by different substrates and inhibitors.